What would happen if the United States became ground zero for a mysterious global pandemic, caused by an extraterrestrial dust mite brought back by an international team of astronauts? Brought back to a country run by a maniacal, Darth Vader-like vice president, who treats President Montgomery like a frat boy figurehead. To a country that assembles a team of scientists at Fort Detrick in Frederick, Maryland, only to ignore their findings and blame everything on Islamic terrorists in Pakistan, which we promptly invade. That's the premise of an eBook thriller -- think "1984", "Animal Farm", "The Road," the Russian sci-fi novel "We" or the movie "Brazil" -- by John G. Nelson called "Against Nature" (Wild Child Publishing.com, Culver City, CA., 317 pages, $6.95, available as a Kindle eBook from amazon.com, or in other eBook formats from www.wildchildpublishing.com). You want dystopia? 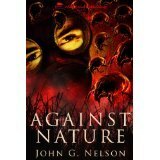 Nelson provides it in spades in "Against Nature." In addition to Vice President Birch (as in John Birch? ), there's a Mad Man type named Vince Captionis who channels George Creel, President Woodrow Wilson's Goebbels, who organized a brilliant campaign to drag the pacifist U.S. into the European war of 1914-18. It's a brilliant touch by author Nelson, to have an ad man who admires Creel (1876-1953), who headed the deceptively named United States Committee on Public Information. Creel, who began his career as a journalist in Kansas City, Mo, said of himself that "an open mind is not part of my inheritance. I took in prejudices with mother's milk and was weaned on partisanship." Hardly an dispassionate, objective journalist, but just the kind of guy the devious Wilson (who campaigned with the slogan "He Kept Us Out of War" in his re-election race in 1916) needed to drag America kicking and screaming into WWI, then known as the Great War. The use of Creel, an active Democrat who ran against the novelist Upton Sinclair ("The Jungle") in the 1934 primary election for governor of California -- Sinclair won and was defeated by Republican incumbent Frank Merriam in the fall general election -- is a brilliant touch. In his last years Creel was a fervent anti-Communist, working with Sen. Joe McCarthy, R-WI and Rep. Richard Nixon, R-CA during the Red Scare of the late 1940s. Countering the bad guys in "Against Nature" is a good guy team assembled by Assistant Director of the CDC Dr. Danielle Santos that includes the beautiful so-called "Black Widow" scientist Dr. (both an M.D. and a PhD) Serena Salus, who quickly determines that crazed Islamic scientists in Pakistan haven't developed the virus, that it developed from an extraterrestrial dust mite brought to earth by a shuttle astronaut. The evidence is backed up when the shuttle's team of American, Finnish, Israeli and Japanese astronauts die within days of returning to earth. When Serena Salus' treatment plan cures her journalist friend Adam Spinoza, who has friends in high places in Latin America, the powers in Washington, DC go after those who don't buy into the "official" explanation, including Dr. Santos, forcing Salus and Spinoza go on the lam. The novel is fast paced in the extreme: I read it in one sitting from a print-out provided by Nelson. The author makes the interesting and to me believable point that Giant Pharma isn't interested in curing anything, just treating it. There's nothing like repeat business! If you groove on thrillers by Robin Cook or the late, great Michael Crichton (think "The Andromeda Strain") "Against Nature" is for you. Given the paranoia of the past decade (Nelson said he was inspired to write the book by the Bush Administration's actions), nothing seems impossible any more.